lifter. 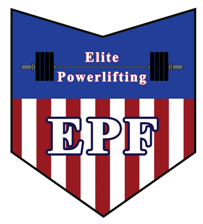 I hope you enjoy the EPF and help us continue to be open to change. MEN’S DIVISIONS: OPEN,114.5, 123.25, 132.25, 148.75, 165.25, 181.75, 198.25, 220.25, 242.5, 275.5, 308.5, SUPERS. WOMEN’S DIVISIONS: OPEN: 97, 105, 114.5, 123.25, 132.25, 148.75, 165.25, 181.75, 198.25, Unl. squat/deadlift suits, elbo supports, powerlifting briefs of any kind.